Anybody growing this one? Any reports on flavor or quality of the fruit, I have one on the ground probably 10 years old at about 2/3 meters high, not much info on the internet however I just notice on the web is on the same family than caimito chrysophyllum; and the pic from inside looks like a hibrid if caimito & chico zapote! Hmm seems synonym for this is Chrysophyllum lacourtiana. It looks quite interesting and I agree with you saying looks like a chico caimito Zapote ha ha. Looks to be about cricket ball size maybe fibrous? Not much info at all but I'm obsessed with African species! There are quite a few African Chrysophyllums that look to have potential. This one looks good I would love to hear a report on flavour. Chrysophyllum lacourtianum. Both Bambu and Ngolobo (another Chrysophyllum species) are huge forest types that commonly get a trunk diameter of 1m. Both fruits are highly esteemed by the nationals here, and are also sold in the market place. 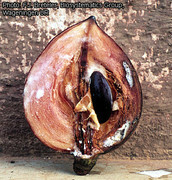 The part that is eaten is actually a sticky, juicy sap that is sucked out of the fruit when a small hole is poked into one end of the fruit. The juice can be sweet, depending on the tree, and it is acidic, causing one's teeth to go on edge. Bambu fruit is an attractive red ball, about the size of an apple, while the smaller Ngolobo is yellow and takes on the size of a golf ball. Though both these fruits are interesting in their own respects we have a hard time recommending it for people with limited space. Mine is about 5 meters , seeds came from Brazil , that's where you got your tree from Raul . Growing slow but steady. No flowers yet . I guess he means that it was awful. They might be related to the star apple but the comparision run dry there. First fruit I had in Kinshasa Market was in taste like a reminder of green sapote overipe from Frank's backyard; eggy canistel like but moist fermented odor & taste not too revolting sweet (I prefer to eat it than eat Fufu). Texture like barely soften avocado! Congolese eat Fufu which is a fermented pounded manioc so this aged fruit were considered a step up in calories and flavor in my humble opinions! A delicacies were it is found because in many place, protein & calories for the Poor Congoleses were luxeries. Food were bland fufu grown from the bitter manioc to break down cyanide! Locust plagues leave cyanide bitter manioc alone! Diet is totally starchy & blant punctate by hot pepper to keep the average Congolese from boredom. So an inferior fruit by our Western standard offer a Thanksgiving Turkey to the malnourish Congolese Population! Other fruits in the outskirt villages five hundred miles from the capital tasted like a mamey sapote in that sweet potatoe milkshake taste but with an addded sometime rancid sour note that clear your nose like chinese mustard. Kind like durian texture but minus the stench & onion butterscotch With sour buttermilk thrown in. Remember it sit ouside in the tropical heat aging before It could be consume. Green fruit immature have goo sap latex quite unpleasant like eating a green Alano sapodilla that has not ripen with milky gumminess and astrigent flavor. OK Raul .....3 years later now ...I got the seeds of our trees from our Brazilian friend Carlos . I talked to him a while ago his tree died and was happy to hear ours are still around . Maybe we should give them the same treatment as the jaboticaba ......water , water and more water . Nice memory Luc!  Carlos Dream frutas, did you ever asked him about flavor of this fruit?